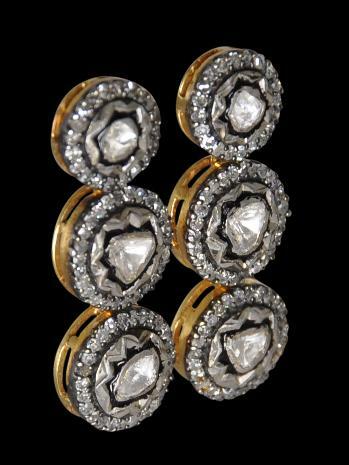 This splendid pair of earrings comprises two rows in three circular settings each of large table-cut Golconda diamonds surrounded by smaller old-cut diamonds in silver settings on gold. The central diamonds are in kundun settings and the surrounding diamonds are in claw settings. 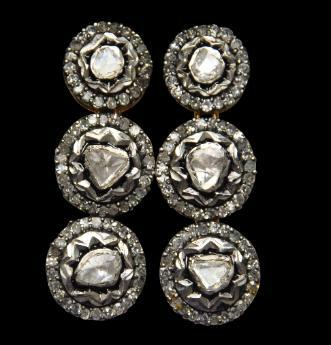 The settings are similar to those used on a set of diamond buttons (p. 205) and a necklace (p. 108) in the treasury of the Nizam of Hyderabad (Bala Krishnan, 2001). The earrings have posts and push-back clips. The earrings are in fine, stable and wearable condition. All the diamonds are intact. Bala Krishnan, U.R., Jewels of the Nizams, Department of Culture, Government of India, 2001.